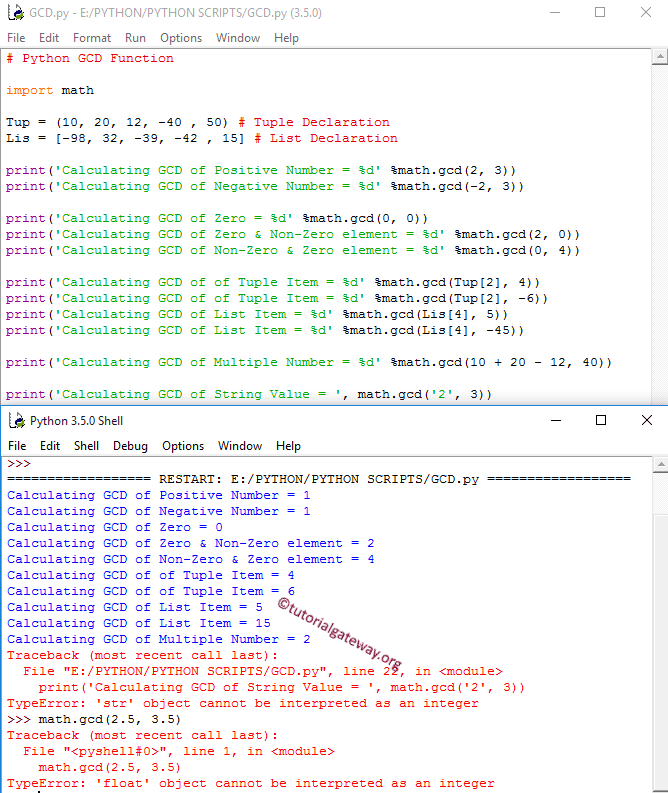 The Python GCD function is one of the Python Math function which is used to return the greatest common divisor of two given arguments. In this article we will show you, How to use GCD() function in Python Programming language with example. Y: Please specify the Y value here. GCD() Function will use these X and Y arguments to find the greatest common divisor. If both the X and Y arguments are Zero, GCD() function will return the output as Zero. If either the X or Y argument is a Decimal, GCD() function will return TypeError. If the X value or Y value argument is not a number, GCD() function will return TypeError. Within the first two statements, We passed both the Positive integer and negative integer as the GCD() Function arguments. From the above screenshot you can observe that, GCD() Function is returning output. Within the next three statements, We passed both the Zero as first argument and second argument. As we said before, GCD() Function is returning the non zero argument as function output. Next four statements, We used the Python Tuple and List items as first arguments and Positive and negative integer values as second argument for GCD() Function. If you observe the above screenshot, GCD() function is working perfectly on them. Next statement, We assigned multiple values as the first arguments and the GCD() Function worked without any issue.